We carved pumpkins this year, I don't usually carve a pumpkin at Halloween but where we are living now there is a great spot on the windowsill for showing them off and the pumpkins were on offer in our local supermarket so I couldn't resist. 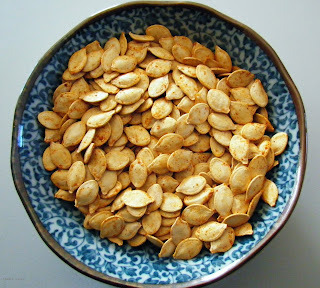 Our pumpkins turned out well but the best part was making these tasty toasted pumpkin seeds with the pumpkin innards. We were left with a lot of seeds which we decided to toast with some spices. I first soaked the seeds in salt water overnight to give them a lightly salted flavour. This is easier than trying to get salt to stick to the outside of the seeds. 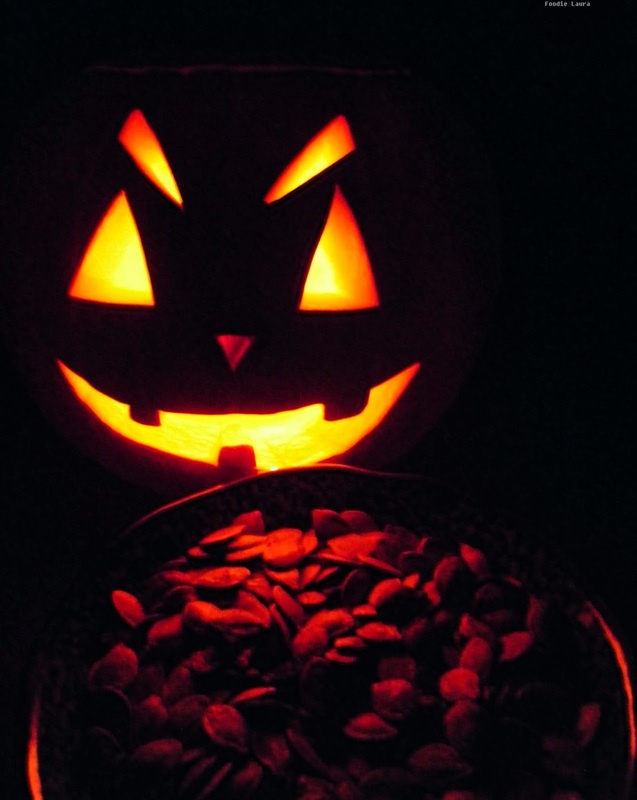 The pumpkins seeds have a natural creaminess to them, warm from the oven they are hard to resist but munching on a handful of these while watching TV is great too. You could add any spice or herb mix to the seeds, I went for paprika. After soaking the seeds, I rinsed them off in cold water and patted them dry. I then sprinkled them with paprika and toasted them on a baking tray in the oven at 150c for 20 minutes. 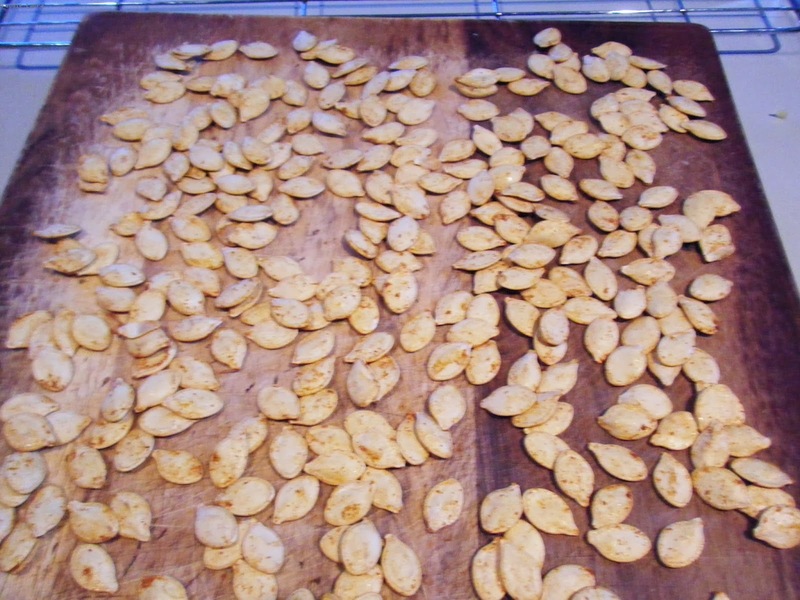 I made these toasted pumpkin seeds in two batches as they need to be laid out flat, if they over lap on the baking tray the seeds don't dry out properly. I left them to cool, again in a single layer on my wooden chopping board. The pumpkin seeds were too small to lay out on my wire cooling rack. 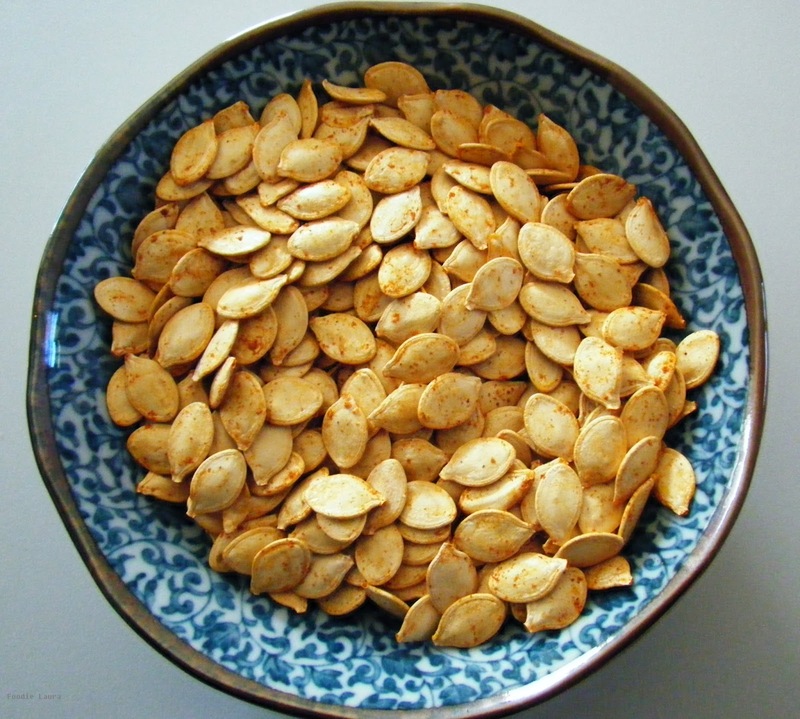 Don't throw away the innards give these toasted pumpkin seeds a try. 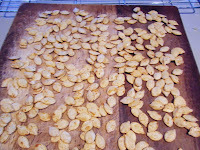 You could add any spices to these, keep them in an air tight container and they will last for a few weeks.